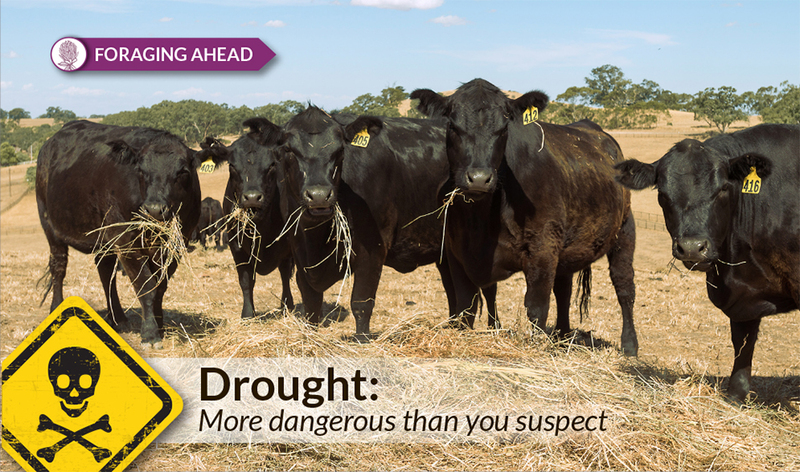 Drought is an annual problem on many livestock farms, typically occurring in summer or early autumn. Obviously, when drought occurs, pasture forage growth slows or stops and livestock may not have enough to eat. This can lead to significant problems as the animals seek alternatives. Numerous plant species are poisonous or can become poisonous under some circumstances. Many cattle and other grazing animals have almost constant access to plants that could harm them. Animals usually won’t consume a significant quantity of a poisonous plant unless there is little else available. Hungry animals, however, are much more likely to eat plants they normally would avoid. And in some cases, drought can cause otherwise harmless plants to become toxic. You can see how problems arise! Nitrate poisoning is probably the disorder most commonly associated with drought. During periods of low soil moisture, nitrates can accumulate in plants that were heavily fertilized with nitrogen. Some plant species are more likely than others to accumulate toxic nitrate levels. Forage crops that fall in this category include pearl millet, sorghum, Sudangrass, sorghum-Sudan hybrids, and corn. Pigweed, smartweed, ragweed, lambsquarters, goldenrod, and nightshades are among the many weeds that sometimes cause nitrate toxicity. Nitrate poisoning is most frequently associated with consumption of hay. This is because nitrates are stable, and levels do not lessen over time. Thus, hay cut during a drought from fields that were heavily fertilized with nitrogen could be toxic months after having been baled. Any hay that is suspect should be tested. Luckily, a simple, inexpensive laboratory test can determine if hay offers a nitrate risk. Feeding technique often plays a role in nitrate poisoning. If animals are hungry when fed potentially toxic hay, they are more likely to consume a deadly quantity. In such situations, it is not uncommon for numerous animals to die. If the hay is suspect, alter the feeding approach to discourage consumption of a large amount of hay at one time. Prussic acid, also called hydrocyanic acid, is another compound that can build to toxic levels in some plants during a drought. Sorghum, Sudangrass, sorghum-Sudangrass, and Johnsongrass are the species most likely to be involved in drought-related prussic acid poisoning. Unlike nitrates, prussic acid is an unstable compound that does not cause toxicity in hay and usually is not toxic in silage. It’s worth noting that the application of some herbicides can also temporarily increase prussic acid levels, and killing frosts are especially worrisome in this regard. The list of potentially toxic plants is too long to cover here, but it may be helpful to at least give a few examples. Some potentially poisonous annual plants that livestock normally won’t eat to a great extent are jimsonweed, pokeweed, sicklepod, and bitterweed. Potentially toxic perennial plants that usually aren’t attractive to livestock but that may be during a drought include bracken fern, various oaks, elderberry, wild cherry, privet, and black locust. Numerous ornamental plants are potentially toxic as well. These include hydrangea, lantana, azaleas, castorbean, wisteria, caladium, hyacinth, and holly. While cattle usually are not allowed access to a yard or other areas where ornamentals are grown, when they get hungry they might see such an area as an oasis (especially if irrigated) and might strive to gain access.